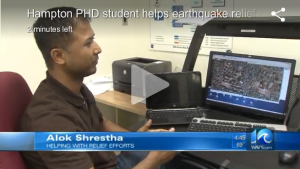 Alok Shrestha, an APS Graduate Student, is offering his expertise in satellite-based remote-sensing to guide the relief efforts following the disastrous earthquake in Nepal on April 25th, 2015. Alok and his wife are from Nepal — their family members are okay, but have been living outdoors due to the frequent aftershocks. Alok was interviewed on the local Channel 10 “WAVY” about his efforts. He works as a contractor at NASA Langley Research Center, through Science Systems Applications Inc. He volunteers his time at work to compare the pre- and post-earthquake satellite images of the areas affected to identify where aids are needed. He can use the satellite images to identify where helicopters can land, roads are disrupted, and people are gathered in tents. Donations are desperately needed in Nepal. Alok requests that donations be made to the Red Cross, WCN Nepal Earthquake Relief Fund, or the International Centre for Integrated Mountain Development. You can read about this news story on this wavy.com article and see his interview below.